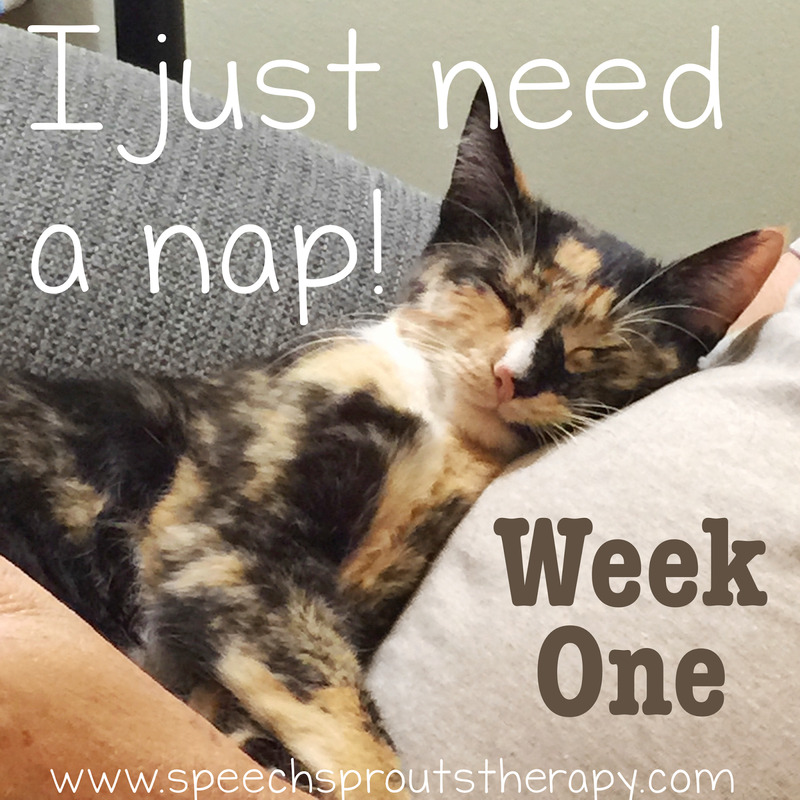 This SLP went home Friday and fell asleep on the couch. I just finished my first week back to school, and I have to admit, it kinda kicked me in the ____! With five ARD meetings (That's what we call IEP meetings in Texas), new software to learn, several move-in students added to my already bulging therapy roll, staff meetings, presenting my in-service on CAS, unearthing my therapy room, staff meetings, welcoming and orienting my new paraprofessional and my new SLP-A, and the staff meetings....did I mention the staff meetings? Whoooo! I was frenzied and exhausted. I'll bet you know exactly what I mean. Students start on Monday, and those bright shiny faces are expecting a great year. I'm going to help give it to them too. We are going to have fun, make some awesome progress and have our best year ever. But sometimes we need a little help, because time is at a premium. we are all headed back to school too! 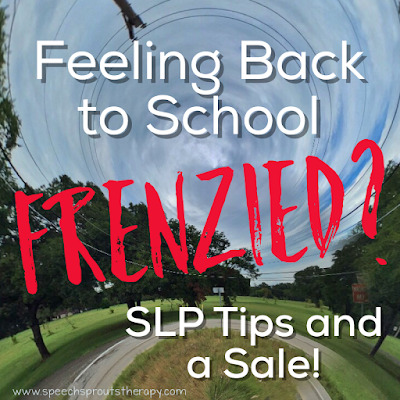 So we are getting together to offer you some terrific therapy tips and tell you about amazing therapy materials to cover your caseload and help make your year, well.... a little less frenzied! 1. 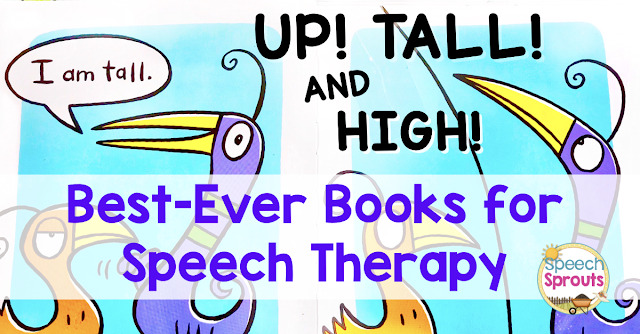 Plan for high-interest themes and activities in speech therapy. When students are engaged, therapy becomes a breeze and a pleasure. I love themes, it keeps me interested too! We'll be thinking about yellow school buses, apples, owls, monsters, spiders, pumpkins and turkeys this fall. 2. Use visuals whenever possible! 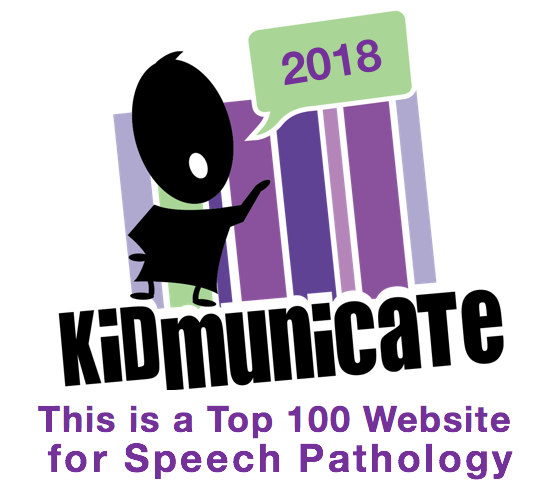 So many of our students with language delays are not strong auditory learners. Visuals can really help. One of my favorite activities in my store, Associations and Describing: In The Doghouse. 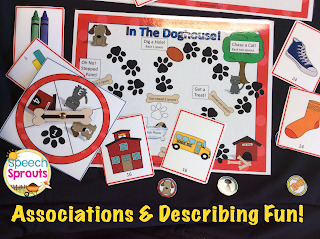 combines a favorite theme (pets) with strong visuals to assist children in describing similarities or associations. The describing mat gives children cues to helps them decribe the similarities. For example: They both have...., they are both part of...... 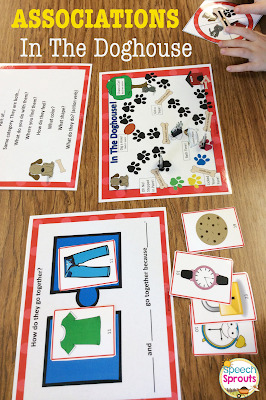 The puzzle mat helps students format their sentence in reply to "How do they go together?" The cute little puppy-dog themed game is fun, and adds a few more language opportunities. What is the dog doing? Why did his pawprints change color? 3. Using one versatile activity that's adaptable for multiple goals, mixed groups and ages will save you time and your sanity! I aim to build in versatility to my packs for this reason- pull one and done! 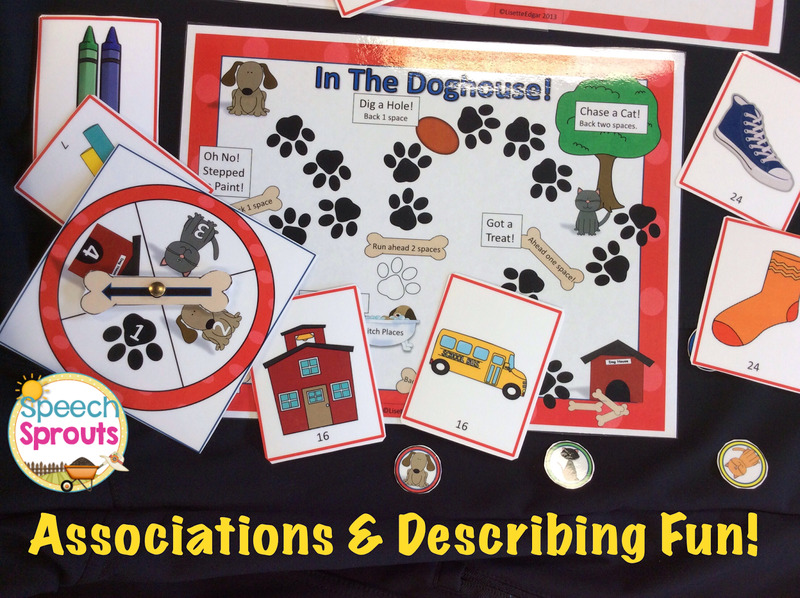 Associations and Describing in the Doghouse works great for pre-k to 3rd grade. Little ones work on vocabulary and basic go-togethers. Older children work on describing the associations. Modify up or down by requiring more attributes per description. Voila! Easy planning. Teachers pay Teachers has announced The Best Year Ever Bonus Sale for Monday, August 22nd! I plan to pick up some products to help me plan out my fall and early winter too, because this one-day only sale means 28% off in most stores. Everything will be on sale at Speech Sprouts store including In The Doghouse. To grab it at his discount, be sure you use this code at checkout: oneday. Good news, I have another $10 TpT Gift certificate to give away. More good news! I am going to be joining in an instagram hop with 19 other SLPs who also have gift certificates to give away!! That means you have 20 chances to win a gift certificate, which are awesome odds, woohoo! It will start at 6pm ET today, 8-21-16. 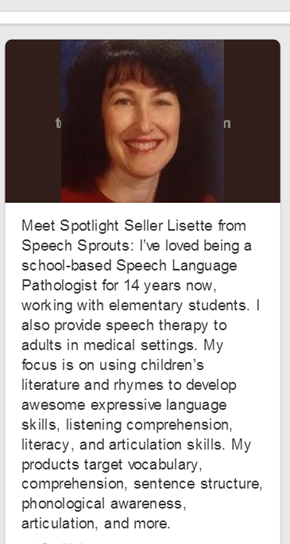 So head over to my insta @speechsprouts and be sure to follow me. Then at 6pm ET, head back and start hopping! Bloggers, if you would like to link up with one of your sale products and therapy tips, add your link below! Be sure to check more tips and great products from the Frenzied SLPs and friends. Just click any post in the linky! 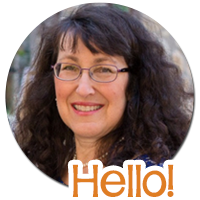 I hope you find some awesome new activities you'll love. In the Doghouse looks like so much fun! Visual cues are so important for our kids who have difficulty processing speech/language. I love that you've created visuals to help formulate the sentences. I use visuals in all of my intervention and resources; I've never worked with kids who don't need them. I've made visuals for story elements, for definitions, and more. I love the In the Doghouse activity. Looks great! Love your tips! I've got #1 down and I need to do a much better job at #2. Don't we all need to keep focusing on #3 to make our lives a little less frenzied! Thank you!